I had been looking for likely candidates for fictional and historical Thanksgiving recipes, when I stumbled upon this dish in one of my cookbooks. I had my doubts about the rose water, but decided to try it anyway. It turns out that it’s not that much different from a standard candied sweet potatoes recipe. The rose and orange flavors go surprisingly well together, and with simmering, the syrup takes on a bit of the earthiness of the yams themselves. Cook’s Notes: I’ve omitted the musk and ambergris at the end of the recipe, mostly for the sake of expense and availability. I imagine, however, that they would make for a significantly different and much more fragrant dish. Parboil the sweet potatoes in a pot of water for about 10 minutes, or until they are just shy of tender, then drain and peel. 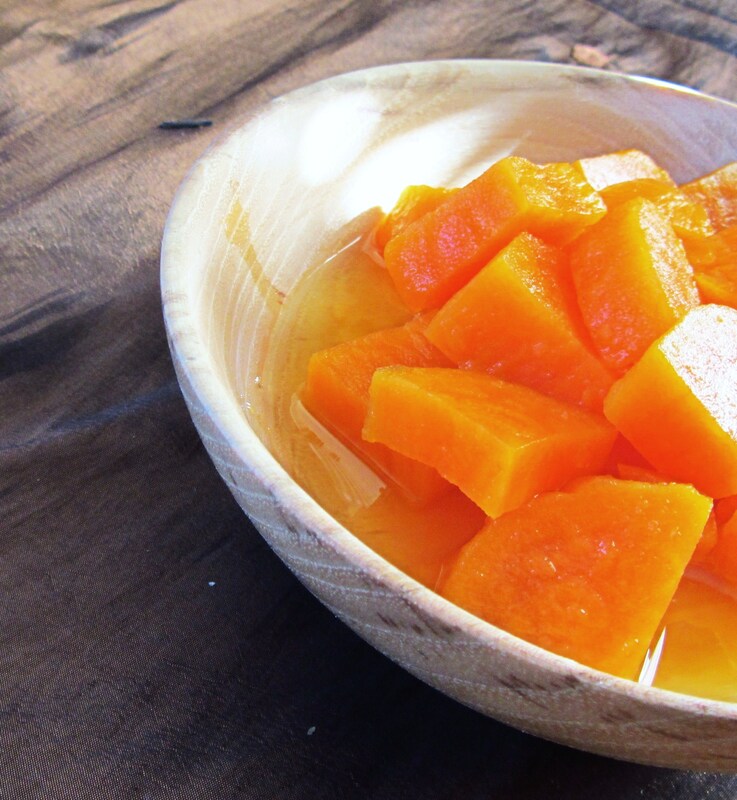 Cut into largeish chunks; any small pieces may fall apart in the syrup. Combine the sugar, water, rose water, and orange juice in a medium saucepan. Bring to a boil, and skim off any scum that rises to the top. Turn the heat down to a low simmer, then add the cut sweet potatoes. Cook slowly for another 30-45 minutes, depending on how long they were parboiled. The finished potatoes should be tender and full of sweet, syrupy flavor. If you like, you can let the potatoes sit in the syrup overnight, making this a great dish to prepare ahead of time. This dish looks really nice! I didn’t know sweet potatoes were ever served in such a way.